Oceans are the largest ecosystems on Earth. This makes marine life an important part of sustaining human life as it accounts for more than 70 % of Earth's surface. Sadly, because of the negative human impact, these marine ecosystems are increasingly degraded and in urgent need of conservation. In celebration of World Ocean Day, WWF Philippines teams up with pro-ocean conservation advocates to highlight the importance of marine ecosystems. It aims to educate the public on marine conservation by way of a photo exhibit. 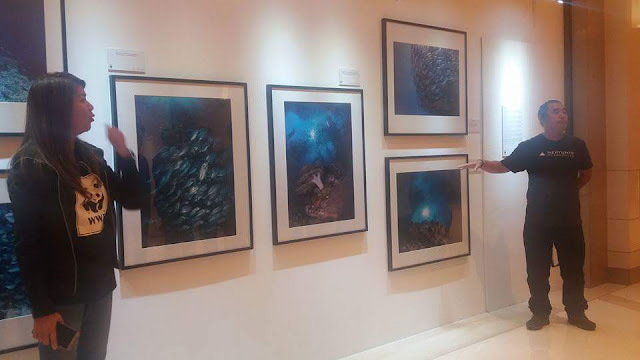 Captivating photos of multi-awarded photographers Anna Varona and Danny Ocampo were unveiled at Solaire on June 8, 2017 to highlight the beauty of the Philippine ocean and the urgent need to protect them. The exhibit showcases a visual spectacle on the beauty of Marine Protected Areas such as Marine Sanctuary in Tingly, Batangas, Apo Island in Negros Oriental, Cagayancillo and Tubbataha in Palawan, and Tanon Strait in the Visayas. Anna Varona, who is a responsible tourism advocate and a marine warrior , believes that this endeavor is very much aligned with the 2017 World Ocean Day’s theme “Our Ocean, Our Future” because it aims to spread awareness on the role of MPA’s in long-term food security. “MPA’s ensure that our coastal resources are given the chance to regenerate and provide us food now and in the future. Aside from that, our fishermen are given much more stable and sustainable livelihood,”she said. Danny Ocampo has been a protector of the seas. He serves as an inspiration to the younger heroes in training. Together with Anna Varona, he campaigns for ethical and responsible diving and photography, and hopes to influence tourist to be more responsible when they visit MPA’s, especially since Apo Island has been instrumental in his journey towards marine conversation work. “Apo Island continues to inspire not only me but hundreds if individuals, organizations and policy makers here and abroad who have been there. Sadly, its popularity is beginning to be its bane and measures have to be taken to ensure that tourism and conversation compliment eac other,” he added. 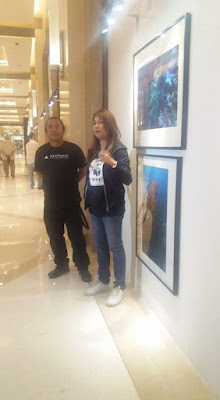 Canon Philippines sponsored the printing of all portraits including the postcard version of select photos that will be sold to help fund the WorldWide Fund for Nature (WWF) Philippines conservation efforts and public education drive on conservation of Philippine ocean. By sharing the wonders of the ocean and marine life, local communities that greatly depended on them will be inspired to protect it. WWF-Philippine’s work in protecting the Tubbataha Reefs Natural Park inspured the declaration of a one million hhectareof MPA by the Municipal Government of Cagayancillo though a municipal ordinance covering its entire municipal waters and surrounding open sea. Celebrate World Oceans Month with the Rule of Two-Thirds photo exhibit at Solaire Resort! And when you're there, check out the gorgeous limited edition postcards. Help support the marine conservation efforts of WWF with every purchase you make. The exhibit is open to the public until June 22, 2017.